Marietta Facial Plastic Surgery, Laser & Aesthetics Center was founded by Seth A. Yellin, MD, FACS in 2011. As Chief of Facial Plastic Surgery at Emory Healthcare from 1999-2011, many of the leading Mohs surgeons in Georgia recognized Dr. Yellin’s expertise in providing superior, natural-appearing reconstruction following large skin cancer resections. His reputation quickly spread to Marietta Dermatology, which has been serving greater Atlanta since 1970 and is the largest private dermatology practice in the state of Georgia. 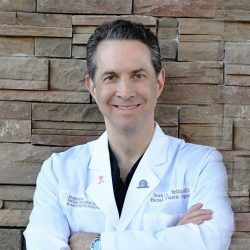 Dr. Jared Friedman, the Mohs surgeon at Marietta Dermatology’s Skin Cancer Center, began seeking out Dr. Yellin’s talents in 2007. Through this professional relationship, Dr. Yellin was offered the opportunity to create a unique partnership with Marietta Dermatology. In 2009, Marietta Dermatology’s flagship location moved into our new, state-of-the-art, freestanding facility. With the new building came the opportunity to offer an array of integrated skin care services. Dr. Yellin was quickly recruited to provide in-house aesthetic and reconstructive facial plastic surgery services and to oversee and manage the aesthetic skin care center. Today, Marietta Facial Plastic Surgery, Laser & Aesthetics Center and Marietta Dermatology are a completely integrated partnership offering an array of services including general dermatology, skin cancer surveillance, Mohs skin cancer resection and facial plastic surgery reconstruction, on-site pathology and an in-house pharmacy. On the aesthetics side of the practice, Dr. Yellin and his team provide surgical, minimally invasive and non-invasive facial rejuvenation utilizing the latest techniques and technology including multiple lasers, intense pulsed light, ultrasound, hydrotherapy and radio-frequency devices, cosmetic nasal surgery, supervised skin care and therapeutic skin treatments. In addition, we offer CoolSculpting, a non-surgical fat reduction and body sculpting technology. To discover how we can help you achieve your aesthetic or reconstructive goals, please call us at 770-425-7575 to schedule an appointment today.